The baiMobile 3000MP Bluetooth Smart Card reader is designed to support most mobile and desktop platforms including Apple iOS, Android, BlackBerry OS 7, BlackBerry 10, Windows 7 and Windows 8.1 and Windows 10. The baiMobile 3000MP Bluetooth Smart Card reader supports standard ISO 7816 smart cards such as the Common Access Card (CAC) issued by the US Department of Defense and the Personal Identity Verification (PIV) issued by other agencies of the US Government. Support for other smart card types is provided by the baiMobile Middleware This wireless solution (baiMobile 3000MP Smart Card Reader and baiMobile Smart Card Middleware) permits network or client applications residing on the device to access the credentials stored on the smart card to perform functions such as digitally signing and decrypting emails, and authenticating to secure web sites and network servers. 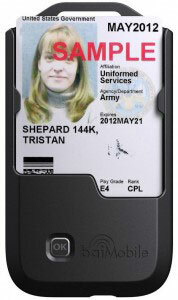 The reader also functions as a badge holder with the printed identification features of the card exposed for visual inspection as seen below. Biometric Associates baiMobile 3000MP Bluetooth (BAL-3000MP), Smart Card reader with CAC, PIV and other smart card support on iOS, Android, BlackBerry 7, BlackBerry 10, Windows 7 & Windows 8.1. Includes wall charger and USB charging cable. Includes hardware warranty and middleware maintenance and technical support for 3000MP reader and middleware for one year from date of purchase, including updates to middleware (provided to the app developers), device drivers and firmware required to provide continued functionality with future releases of supported operating systems and new smart cards types, includes email and telephone support.